Thursday (22/02/18) night in a packed Gael-Ionad Mhic Goill, the hub of Upper Springfield based Irish medium Youth and community organisation, Glór na Móna, saw the official launch of Athmhúscailt an Fhathaigh (Re-Awakening the Giant). This environmental youth heritage project, was funded by the Heritage Lottery ‘Young Roots’ scheme and lasted 12 months, engaging over 150 young people from the Upper Springfield, and further afield. Celebrating over 35 years of steadfast activism on the Black Mountain, and honouring those who committed their voluntary time and effort to overturn the destruction that was taking place with Quarrying on the Black Mountain – the Glór na Móna youth team shone a light on past victories and took the opportunity to reflect on this unique heritage and make it accessible and available to the community again. 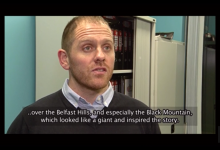 The project, which took place in part on Divis and the Black Mountain, whose names both derive from Irish word ‘Dubhais’, meaning ‘black ridge’, was aimed at re-engaging the local community in the story of the Hills. 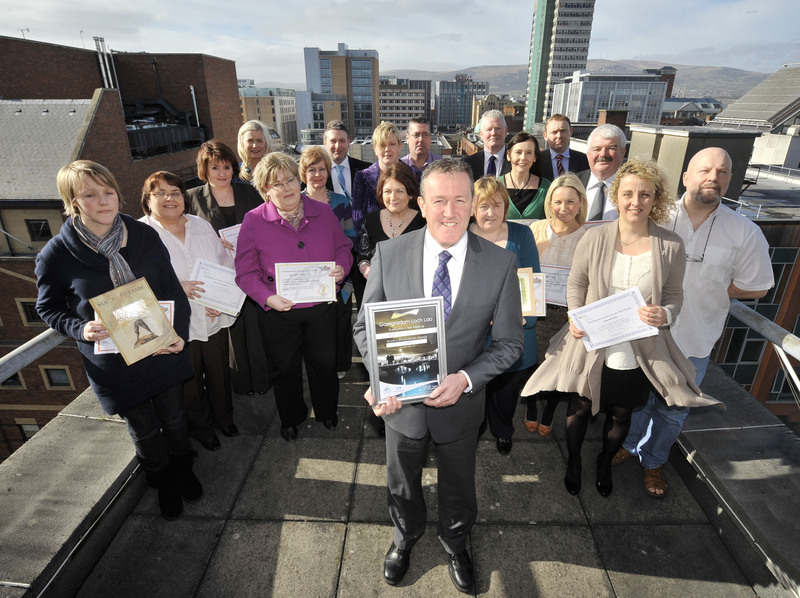 The event saw the launch of a new community archive website, featuring digitised material from the Terry Enright Community Archive and the Belfast Hills Partnership Archive, alongside the launch of new community documentary, An Fathach (The Giant). 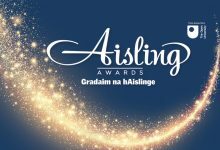 Standing on the shoulders of giants, both literal and figurative, the Irish language youth and community organisation launched its latest environmental and heritage project, Athmhúscailt an Fhathaigh (Reawakening the Giant) to a delighted audience. The project takes its name from the work of the famous Anglo-Irish writer and satirist, Jonathan Swift, whose inspiration for the sleeping giant in his classic novel Gulliver’s Travels, is widely regarded as being inspired by his view, from the east of the city, of the Belfast hills. 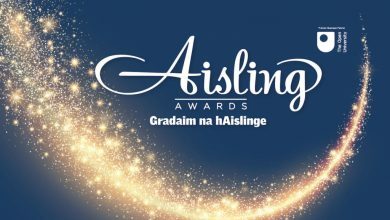 “The young people that took part in Athmhúscailt an Fhathaigh, as well as the local partners, are what made the project such a unique success. We worked with local environmental and heritage experts like Cormac Ó hAdhmaill, Gearóid Ó Muilleoir and the digital archivist Roddy Hegarty from the Cardinal Ó Fiaich library who facilitated practical workshops with our young people. 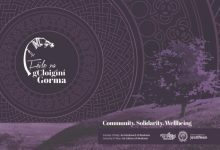 The project aimed to bring into focus the potentially lost heritage of the Belfast hills, in the form of local and natural history; social history, folklore, songs, stories, wildlife, and the environmental community activism that has taken place on the hills. 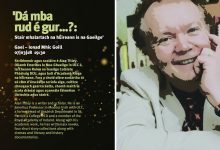 Our short documentary ‘An Fathach’ that was launched last night will be available on our new interactive website www.ansliabhdubh.com along with a treasure trove of digitally archived material and memorabilia including photographs, videos, audio recordings, map and documents. ‘This was simply the next step in a journey that began over 30 years ago with local environmental activists standing up for their community, and overcoming adversity against all the odds. Tonight would not have been possible without the amazing support of the Heritage Lottery Fund, the project funders. We hope we have provided a clear example of the calibre of the work that is possible when young people engage with their local heritage. Glór na Móna view this as only the beginning of our engagement with our greatest local asset: the Black mountain. Our long-term vision is to expand on this project by developing a more comprehensive and meticulous archive that reconnects local people to their native place’.